In addition to high quality videos with beautiful color and super clarify in daytime, the 1280*720P hd camera with 75 degree wide angle lens can also record in low light environment, with this excellent specialty, you can use it for both daytime and low light environment. With the built-in rechargeable 720 mAh battery, the portable spy pen camera supports recording up to 5 hour after full charge. The Conbrov HD088 also supports recording and charging at the same time, you can attach an external power bank or charging adapter to charge while recording. 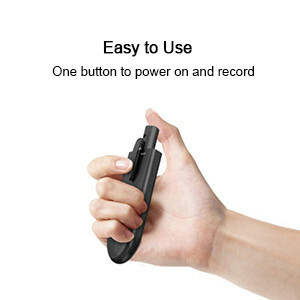 This pocket spy pen camera supports class 10 microSD cards with at least 8 GB and max 32GB capacity(microSD card NOT included) for loop recording. When the card is full,it will automatically overwrite the oldest video files with new ones， you should copy the recorded clips into your computer or laptop timely. 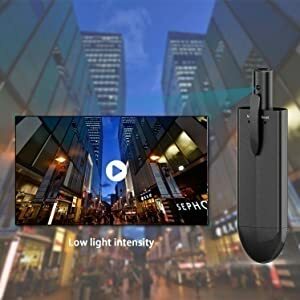 How To Use Conbrov HD088 Pocket Video Pen Camera? 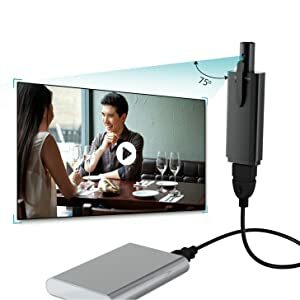 L and HD mode can be chosen in 460x360P and 1280x720P before recording based on your specific need.Full charged battery supports video recording up to 4.7 hours under L Mode and 5 hours under HD Mode. One button to power on and record, this camera is so user-friendly that a child could operate it. 1. Q: What’s the type of HD088’s battery? How about the capacity? A: It’s rechargeable Li-battery and the capacity is 720mAh. 2. Q: How long can it continue to work after fully charged? 3. Q: How larger of the Micro SD card can it support? use the SD card larger than 16G. 4. Q: How long can it work when I use the 32G SD card? A: 11.5 hours in L Mode and 3.5 hours in HD Mode. 5. Q: How long does HD088 take for fully charged? A: About 2 hours with 5V/1A adapter. 6. Q: What should I do if the function button can’t work? A: Please reset the camera with the pin. 7. Q: What can I do if the computer can not recognize the camera? A: 1) Please check the USB port of the computer or connect to another port. 2) Restart the computer or reset the camera. 8. Q: What if the video can not play or play without sound? A: Please play with other video player or restart the computer. 9. Q: What to do if the SD card can not save video or the storage it’s 0KB? card which is class 10 and larger than 16G. 10. Q: Why the resolution mode can not switch? 11. Q: Why the date of the camera can not update? 12. Q: Why the camera power off when the storage is full? Is it can not loop recording? check the the second line of the SETTIME file is “Yes” or “NO”. 13. Q: Why did I press the stop button but the camera still recorded? you press it and observe the status of the indicator light. 14. Q: Can I record video and audio at the same time? 15. Q: If camera is continuously left to record, will it automatically save file? A: Yes, it will save automatically. 16. Q: My camera doesn’t record continuously. How do I fix that? separately in every 5 minutes. 2, Unzip the “HD088 Sound Updating Software” files to “DestBin.bin”. 3, Copy the “DestBin.bin” file to the formatted microSD card. 4, Install the microSD card to HD088 spy pen, turn on the spy pen, you’ll see blue LED lights once and then red LED lights slowly for about 5 seconds. When you see blue LED flashes quickly, it means updating successfully. 5, Format the microSD card to FAT32 again. Then you can use HD088 spy pen to record sound and video . Note: The spy pen couldn’t be powered off during upgrade, so please make sure it has enough power before upgrade, and remember to format the microSD card after upgrade.